DOOM CARES NOT FOR CHRISTMAS. 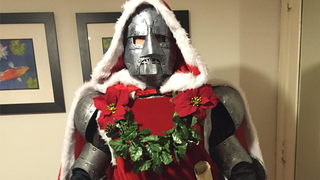 Well, I guess that's a lie, thanks to this incredible cosplay by Cash Branson - Santa Doom is coming to town, and he's got one hell of a naughty list. I now want a to see a Christmas Cosplay showdown between Santa Doom and Festive Squirrel Girl. Truly, a festive battle for the ages.